That got you thinking didn't it? Blue and Green? Well there is a little bit of Danish Blue in the predominantly Green vegetable soup. However, this is really just another version of what Fiona at London Unattached described so well as 'Stone' Soup. You can read all about it on her blog HERE. 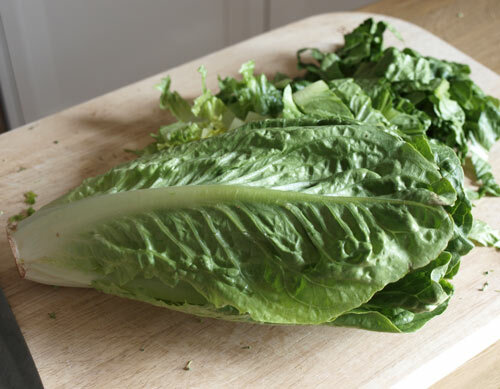 Because I have been eating the Bulgar Salad for lunch, I haven't had my usual sandwiches and therefore we have not used as much lettuce as before. I was blissfully unaware of this when I ordered the shopping online and ordered up another pack of Romaine lettuces. We also seemed to have a head of broccoli left over. I know, I really should check the fridge before doing my shopping. The No Waste Food Challenge run by Kate at Turquoise Lemons also asked us to use up left over Fennel. 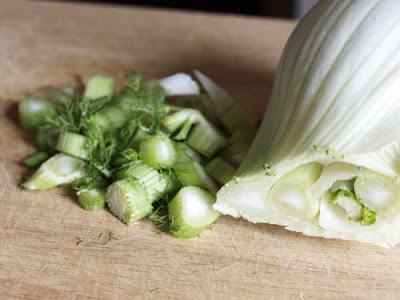 Now, I love fennel and rarely have any left over, but it was a good excuse to go and buy some so I have included at little of it in this recipe. Put the oil in the pan at a medium heat, add the onion and saute for about 5 minutes until soft. 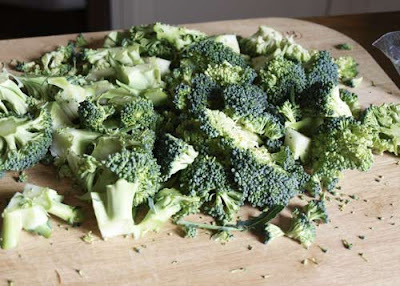 Add the chopped broccoli. and stir to coat with the oil and onion. 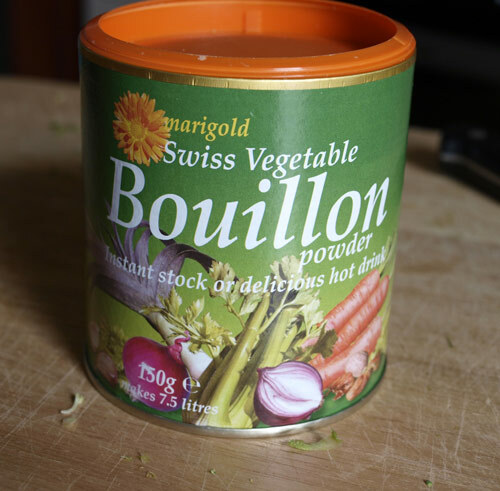 Add the stock, I use Marigold Swiss Vegetable Bouillon but you can use any stock. Season and cook until the vegetables are soft. Take off the heat for about 10 minutes and then blitz with a stick blender or in a liquidiser. Add the milk and the Blue Cheese to taste and blitz again. While the soup was cooking, I thought I'd make something nice to have with them. I had bought some gluten free ingredients for the guest who was expected last weekend but was unable to come. So I thought I would 'use them up' making some scones. I turned to my standard scone recipe from Mary Berry's Fast Cakes, it's never failed me yet, even when I change the ingredients as much as I have here! Put the flour and baking powder in a bowl and add the margarine, rub it in with your fingertips until the mixture resembles fine breadcrumbs. Stir in the mustard powder and the grated cheese. Crack the egg into a jug, lightly beat it and then make up to 150ml with milk or yogurt. 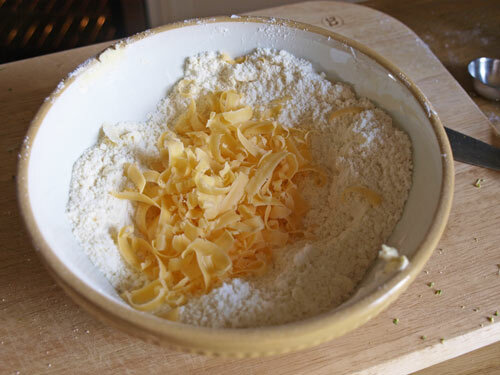 Stir the egg mixture into the flour and mix to a soft dough. Turn onto a lightly floured table and pat out to about 1.25 (1/2 inch) thickness. Cut into rounds, I made my big as we were having them as 'rolls' with our soup. 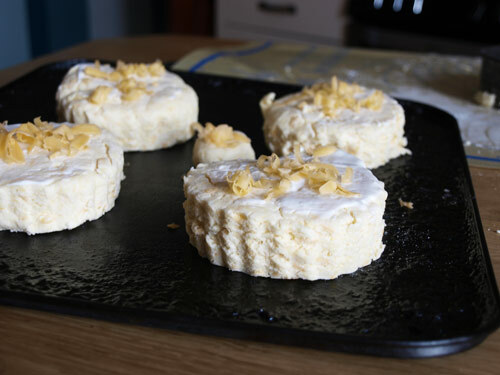 Place spaced out on the baking sheet and brush the tops with milk or yogurt and sprinkle with a little more cheese. I'm showing you this so you can see how thick they are cut. Bake in the oven for about 10-15 minutes (depending on how big you made them) until they are pale golden brown. Remove and leave to cool on a wire rack. 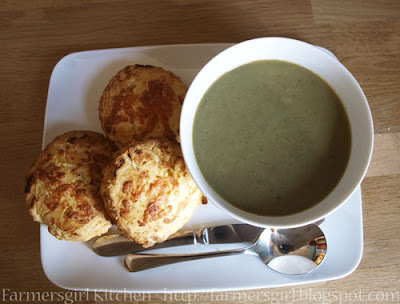 Not only was the soup good, although dominated by the broccoli and blue cheese flavours, but the scones were excellent. A little more chewy in texture than the wheat flour ones, but definitely good and a very acceptable substitute. They could also be adapted to be dairy free by using substitutes for the milk/yogurt and cheese. 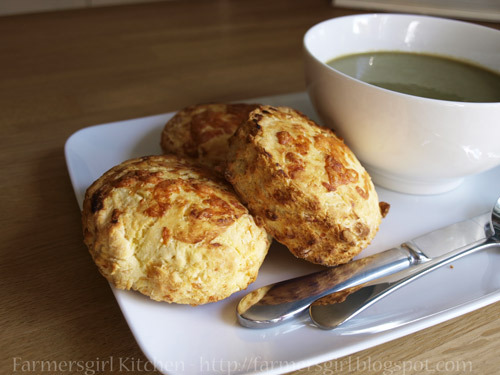 Soup and scones both look delicious. Handy to know you can knock up some gluten free scones if the need arises. I was thinking earlier to day I fancied making scones, but not sure I shall get around to it. It's great that you managed to use so many things up in one meal! Those scones sound pretty interesting to me, I'd have never thought they'd come out as good as that! Looks like a delicious healthy meal. You've made me want scones though - not difficult as I almost always want scones! They look great. You're right though - they do need cutting thickly - they never rise as much as people expect. I love that leftovers can be combined to make an awesome soup - often the best kind! 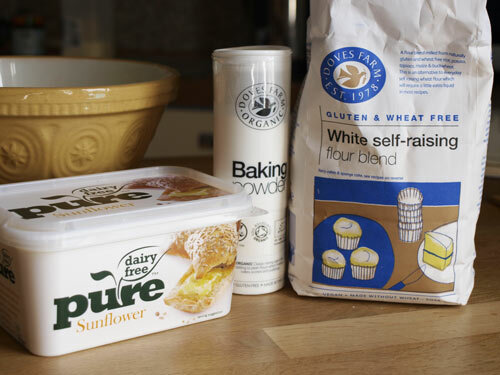 I have been looking for a gluten free scone recipe that makes a dough to cut out rather than sloppy mixture to be scooped - I shall have to give this one a go. Great recipe and post! I have several books that have stone soup featured, and love the name. I am also a BIG lover of Marigold Swiss Vegetable Bouillon....I use the low salt one!